"Well you can't beat a well made sourdough margherita, then again, I'm a sucker for anchovies and find it hard to look past them on a menu..."
"...recently I've been making more white pizzas (without the tomato sauce) and brussels sprouts on a pizza was a revelation..."
"MEATBALLS!" they rouse, "Kale, potato, have you tried them on a pizza?" I clearly wasn't in a particularly decisive mood although it also highlights that you can't define perfect pizza, it's different things, to different people, at different times. 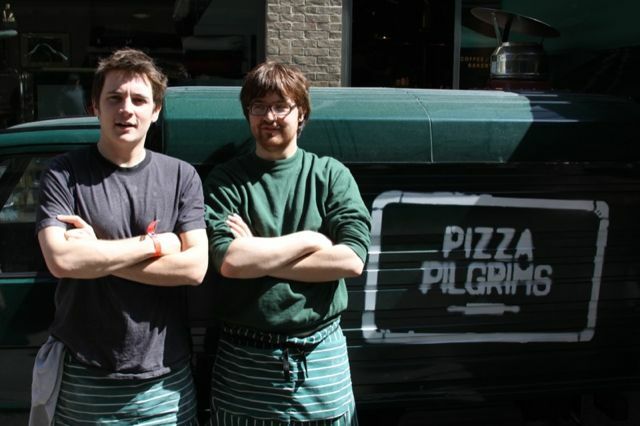 What you can work towards is truly great pizza, memorable pizza, and that's what all the guys below specialise in. After my inability to pick a single favourite I got in touch with some of my favourite pizzerias to see what the top pizzaiolos in the UK choose when they have blank canvas of dough. "We do pizza. 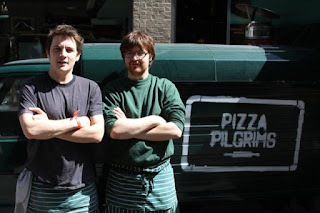 Pizza's fun to make & fun to eat, but we're not about pizza it's just a vehicle that we use we're about organic food and earning a living from using organic food to support farmers & growers who are out there saving the soil. Everything we buy is 100% certified organically grown with the exception of the spring water we use to make the dough - it can't be called organic, but it's drawn from certified organic land, which is the closest I can get & sea salt - it also can't be called organic, but the brand we use is certified by the soil association as suitable for use in organic cooking. I don't use yeast - because there isn't an organic one. There are seven organic pizza flours in Italy having tried them all the one I use is the best for the way we cook @ 405c or 410c. People seem to like our product so I'm pleased. Me - when I'm by myself - my partner & kid usually hijack the recipe. I always make a pizza around 3 basic ingredients egg, garlic roasted, fresh baby spinach & birds eye chillies adding an ingredient here & there"
"My personal favourite pizza topping here is our Veal Meatball pizza. We use a white panna base. 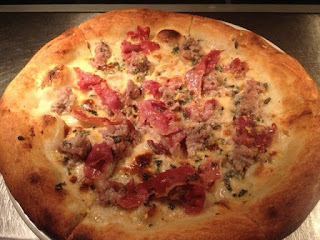 The pizza is then topped with torn San Danielle and our own Veal meatball mix. We make our own mix in house each day. Some chopped sage is sprinkled over the top and the pizza is placed in the oven. We hold our ovens at a lower temperature to traditional ovens as our dough has a far higher water content when compared with usual pizza dough. If the temperature is too high the crust will burn on the outside before the pizza is cooked through. The cooking time is normally between five and six minutes. The pizza is then sliced and finished off with some freshly grated lemon zest. Heaven. 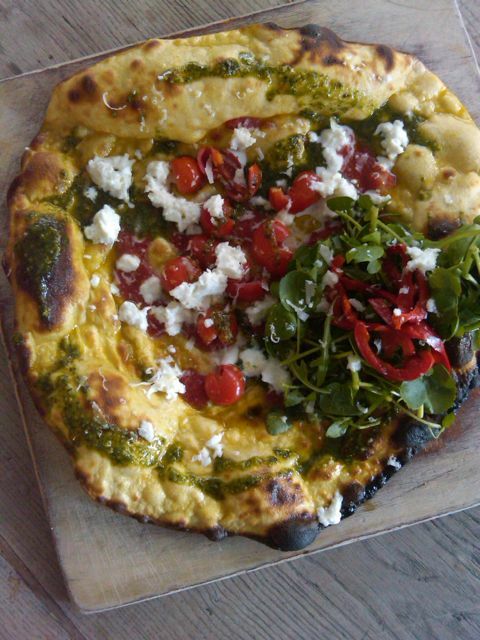 This is my personal favourite but our biggest sellers are the Margarita, Salami and our Cotto pizzas. I cannot stress enough the attention that should be paid to the quality of the dough and the freshness of the toppings. If you keep this in mind at all times then you’re well on the road to producing the best pizza possible." "I think our favourite topping of the last year has to be Nduja [edit: aka The Ninja as I insist on calling it]. It is a spicy sausage from Calabria in the South of Italy, made from the belly and cheeks of the pig, along with a (very) high proportion of Calabrian chilli (sometimes around 50%). It is then smoked and cured. We discovered it on our "Pizza Pilgrimage" at the end of 2011 in a small town called Spilinga. The fatty cut of meat used means that it also has the strange property of being spreadable. This also makes it amazing on pizza - as the Nduja melts in the hot oven and releases pools of hot, spicy, meaty oil. It needs to be used sparingly for this reason, and we often don't add any olive oil to the pizza to compensate. 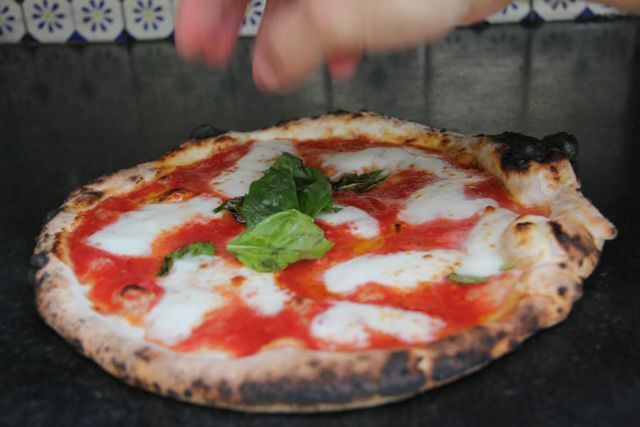 It works well on a bianca base, but we think it is hard to beat just added to a sourdough Margherita." "As you may know, we have a very small main menu (6 pizzas) as we use the best quality (local wherever possible) ingredients and make everything ourselves. We also always have two weekly specials, and the most popular have been the pulled pork and BBQ sauce (inspired by our trip to Orlando where we had fabulously gluttonous trip gorging ourselves on delicious street food!) and Chaumes, trompette mushrooms and smoked garlic (all ingredients purchased from a trip across the channel to visit some french markets)." "The main thing is...that we are sort of against toppings. For us the best topping is just the fior di latte mozzarella. We are pioneers of the "less is more", the less you put on a pizza, the better. Only this way, you can taste the freshness and lightness of the dough, and the tomato sauce. Toppings would hide the underneath flavours! Fave topping: just tomato sauce with garlic and origano (Marinara) fior di latte mozzarella (margherita) or going for the buffalo mozzarella (bufalina). Nothing else. Fior di latte mozzarella, typical neapolitan mozzarella, has a very delicate and light taste. Combined with the tomato sauce, reaches the perfect combination. Has to be cooked in a 450-485 degrees oven for 50 seconds. Over doing it, will become liquid. Buffalo mozzarella, made with buffalo milk typical of the area of Mondragone and Battipaglia. Has a very strong taste, the texture is nearly rubbery and chewy. It's the deluxe version of the regular fior di latte."